TODAY has kicked off their Holiday Toy and Gift Drive – and this year they are celebrating 20 years of giving. Since 1994, they have distributed more than $335 million in donations, helping more than 3 million underprivileged children, to more than 200 organizations across America and to U.S. military bases abroad. Donating is simple! The Today Show Wish List includes this season’s hottest toys for kids of all ages and interests​. Click the Amazon link, add as many items as you like to your cart, complete the checkout, and Amazon will do the rest. All donations are appreciated, no matter how big or small. They are most in need of toys for boys of all ages, and tweens and teens up to age 18. For many, TODAY is their ONLY source of gifts for the holidays. There will be no toys this holiday season for these children unless you choose to help. 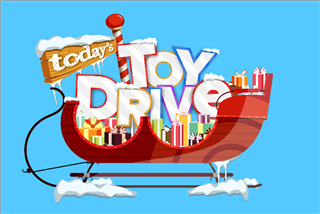 The TODAY Show Toy Drive is a project of the TODAY Show Charitable Foundation, Inc., a 501c3 non-profit organization. All donations are tax-deductible to the extent the law allows. Let's work together in making their 20th Anniversary Toy Drive the most successful ever. It comes at a time of great need. Requested Oct 19/08 - will post again when it arrives.